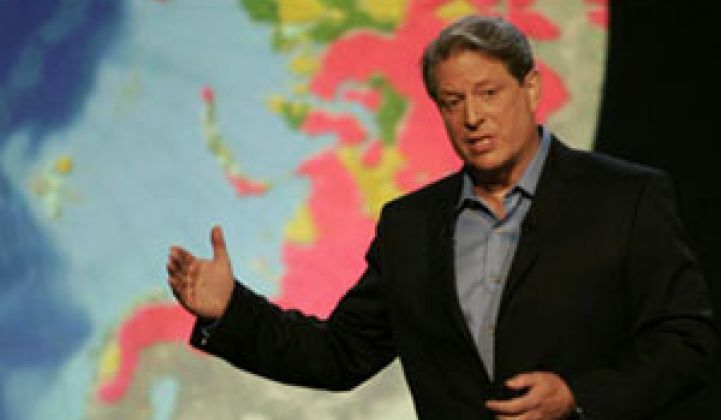 Former U.S. Vice President Al Gore said Wednesday that adopting a carbon tax is one of the best things governments can do to fight climate change. "I know this sounds like a bigger idea than the political system can accommodate," Gore said during a Web cast discussion with Cisco Systems Chairman and CEO John Chambers. Gore said he is convinced that reducing taxes on businesses and employees -- and replacing the lost revenue with pollution taxes, principally a carbon tax -- is the way to go. With no price tag today, CO2 is not just invisible as a gas it’s also "invisible to the markets," he said, so it’s not taken into account in the daily decisions of governments or businesses. Adding such a price tag would spur innovation in CO2-reducing technologies in industry sectors like solar, wind and energy efficiency, Gore said. In February British Columbia said it plans to introduce a carbon tax; San Francisco Mayor Gavin Newsom said he hopes to get a carbon tax passed this year (see British Columbia Curbs Carbon, Gavin Newsom: ’We’re Still Playing in the Margins’ and SF Mayor Gavin Newsom Makes Waves). Last month the Congressional Budget Office released a study finding that a carbon tax could achieve emissions reductions at a much lower cost than an economic cap, which is often presented as an alternative to the tax (see the office’s Director’s Blog). At The Wall Street Journal’s ECO:nomics conference earlier this month, several speakers, including General Electric CEO Jeffrey Immelt, suggested that although a carbon tax might make sense, the word "tax" is too polarizing to be politically acceptable (see Schwarzenegger: Federal Government ’Asleep at the Wheel’). Meanwhile the U.S. Senate is considering a bill, introduced in October by Sens. Joseph Lieberman, I-Conn., and John Warner, R-Va., that would create a cap-and-trade program to limit the amount of carbon some companies could emit. The bill would also set up a trading system in which less-polluting businesses could sell credits to heavier polluters (see New Climate Bill Could Boost Greentech). Economists such as Arthur Laffer also have weighed in against cap-and-trade-schemes.